G. Wayne Clough, a civil engineer and past president of Georgia Institute of Technology (Georgia Tech), served as the Smithsonian’s twelfth Secretary from July 2008 to December 2014. Born in 1941 in Douglas, Georgia, Clough is the first Secretary from a southern state. He attended Georgia Tech and received both his BS and MS degrees in civil engineering. He then went on to the University of California, Berkeley, to earn his PhD in 1969. His research specialties are geotechnical engineering, including earthquake studies, numerical analysis, soil structure interaction, in-situ testing, and underground openings. Clough was a professor at Duke University, Stanford University, University of Washington, and Virginia Institute of Technology before returning to serve as president of Georgia Tech in 1994. For the next fourteen years, Clough made his mark on the school by upgrading its facilities, coordinating the use of the Tech campus for the 1996 Atlanta Olympics, and increasing its fundraising. 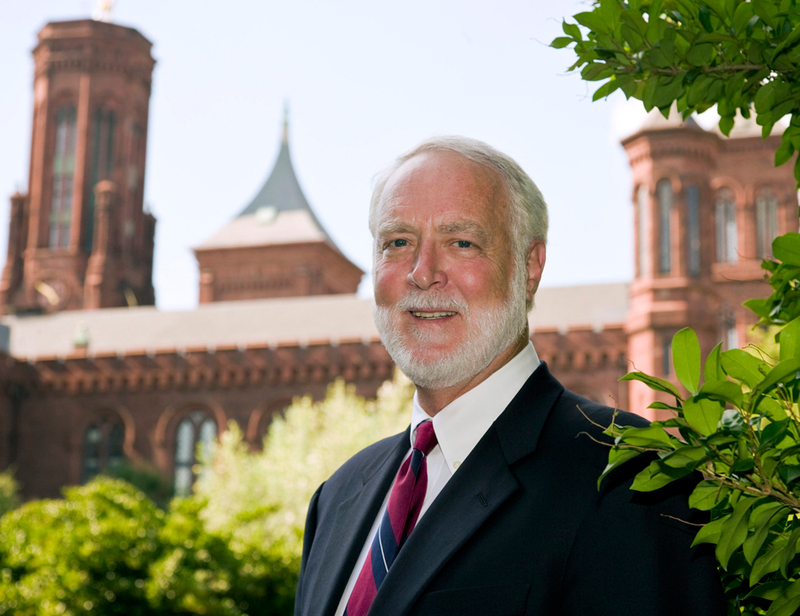 After the tenure of businessman Lawrence Small, the Smithsonian Board of Regents returned to a more traditional Secretary, appointed from within academia. Clough became Secretary in July 2008 and quickly acquainted himself with the large and complex Institution. He traveled to all of the Institution’s nineteen museums and nine research centers, and learned about the many research activities taking place in more than ninety countries. He even made a trip to Antarctica—the first Secretary to do so. During his tenure, the Smithsonian reopened the National Museum of American History, and opened both the Q?rius education center, David H. Koch Hall of Human Origins and Sant Ocean Hall at the National Museum of Natural History. Clough welcomed the Space Shuttle, OV-103, Discovery Orbiter, to the National Air and Space Museum’s Udvar-Hazy Center in April of 2012. He initiated a new plan for the South Mall which includes the Smithsonian Castle and extends to the Hirshhorn Museum. He ensured preservation of the Arts and Industries Building, the first building constructed to be the National Museum of the United States. Construction also moved forward smoothly on the new National Museum of African American History and Culture. A major part of Clough’s tenure was the development of a new Smithsonian Strategic Plan. The plan consists of four grand challenges: Unlocking the Mysteries of the Universe; Understanding and Sustaining a Biodiverse Planet; Valuing World Cultures; and Understanding the American Experience. Another major goal for Secretary Clough was to make the Institution’s vast collections more accessible and available to everyone. All of the Institution’s museums are currently digitizing selections from the Smithsonian’s 137 million objects. He also organized a new educational initiative across the Institution and expanded scientific literacy programs. Clough envisioned an interdisciplinary approach to the Institution to expand the Smithsonian’s global relevance and shape its future through research, education, and scientific discovery. Clough also launched the first national Capital Campaign at the Smithsonian that secured $1 billion at the time of his retirement.